Newt Gingrich – Political & Current Affairs Blog Published by Celeste Greig. 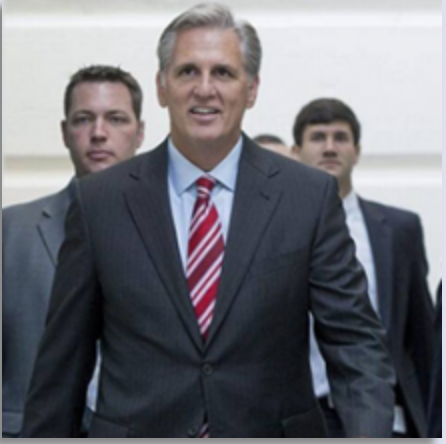 If I were in the House of Representatives today, I would support Kevin McCarthy for Speaker. My choice would not be a close call. As a member of the California Assembly, Kevin became Minority Leader (the top Republican) after just one term in office. I worked with him at the time and was deeply impressed with his vision of a solutions-oriented, activist conservatism that could grow a majority. He brought that positive vision to Congress and immediately began to have an impact. As House Ways and Means Committee Chairman Paul Ryan points out in his well-argued endorsement, Kevin helped eliminate earmarks after Republicans took the majority in 2010. He worked with Chairman Ryan to pass four consecutive balanced budgets. He fought the Senate and President Obama to control spending. Kevin understands that the most important characteristic of a leader is cheerful persistence. This is especially important for a leader in a body as diverse and complex as the House. He has the energy and the personality to listen carefully to every member. Speaker John Boehner led the GOP back into the majority in 2010 and then continued to grow the party’s strength so that today Republicans have their largest majority since 1928. Kevin has been a crucial figure in these victories. He has spent countless hours traveling the country to elect Republicans. He has helped recruit, fund, and train the new members. He has also played a key role in helping endangered incumbents survive, which is equally necessary to grow the majority. It will now take all of that commitment and energy to keep and build on the GOP’s historic strength in the House. Kevin has proven that he has those skills and that drive. You also have to negotiate with the Senate, which is very complex and difficult in its own way, and with an often hostile president. While doing all of this, you have to deal with a national press corps that is trying to trip you up and emphasize the most trivial and negative stories they can find. Finally, you have to rally your supporters across the country, recruit new candidates, and work to win elections. In that process, you have to collaborate with the Republican National Committee and whoever emerges as the Republican presidential nominee. Kevin McCarthy is the one House Republican prepared to do all of these complicated tasks simultaneously. If I were still in the House, I would enthusiastically support him to be the next Speaker.